Michael Francis McLaughlin, a homeless 48-year-old man in Gastonia, North Carolina, just had one thing on his mind. Well, two things. For one, he wanted money from people passing by. Secondly, he wanted a cheeseburger. At least, that’s what his sign said: “I’m thinking of a cheeseburger.” He was cited by Gastonia police and thrown in jail where, presumably, he was told, “You no can has cheezburger.” Unless, of course, that’s what was on the menu at the county jail. I wonder if he would’ve been thrown in jail if his sign had read, “I’m thinking of a job,” “I’m thinking of a billion-dollar inheritance,” or some similar message. Probably so. Still, all he needed to do to stay out of trouble and become an Internet legend would be to throw a picture of a LOLcat on his next sign, then he can has infamy. 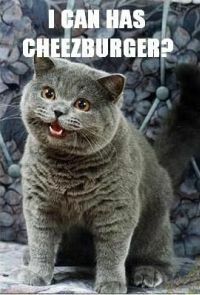 Image: I Can Has Cheezburger?